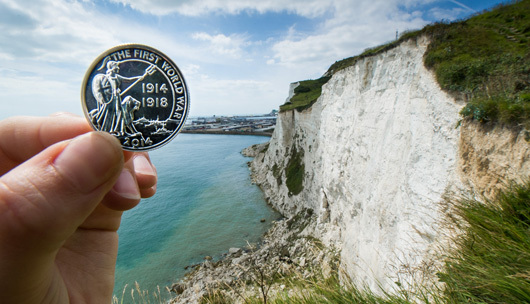 With the world remembering the outbreak of the First World War, H&G has been busy helping The Royal Mint commemorate the Centenary with the release of a new £20 coin. The coin, bearing the image of Britannia looking out at the first boats leaving for France, is only the second ever UK £20 coin and is available for just £20. The team headed down to the South coast to photograph the coins with some creative shots to visualise the story. We also organised for a host of broadcast and newswires including ITV, PA and Getty Images to visit The Royal Mint and see the coins being struck. The £20 coin caught the imagination of the media and has became part of the story surrounding the First World War commemorations. The coverage has been amazing (when is it not?!) with the coin featuring across every national newspaper, including The Sun, Daily Star, Independent, Daily Telegraph, Daily Mail, The Guardian and two pieces in the Daily Express, as well as making AOL and MSN. ITV Wales used their footage taken at The Mint on the evening news, and the images from PA and Getty Images have been picked up by regional papers across the country.